I feel as though I am still not getting through to some people with regards to market efficiency. What can you do to convince people who possess a reality distortion field and who think they can beat games in which they have no edge? It is undeniable that in the long run the wisdom of the crowd predicts the correct probability for selections in a sports betting market. Another problem I have is getting people to understand what "the long run" means. We can't judge the efficiency of a single betting market, any more than we can judge whether a coin is biased or not after a single toss. The markets and the coin have to be repeatedly tested. To demonstrate what the long run is and its implications I created a simple coin tossing simulator in a spreadsheet. 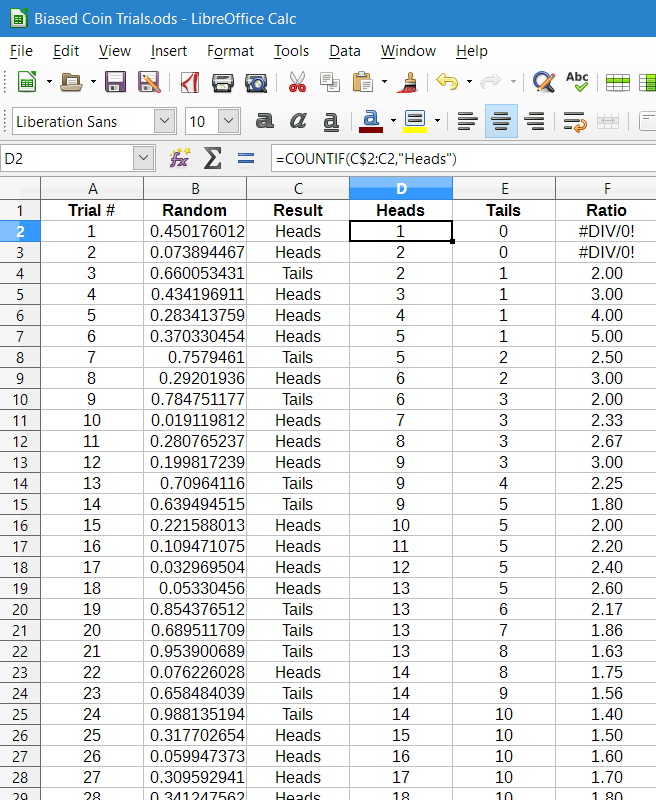 The spreadsheet determines the ratio of heads to tails and then charts are created for various simulation trial lengths. 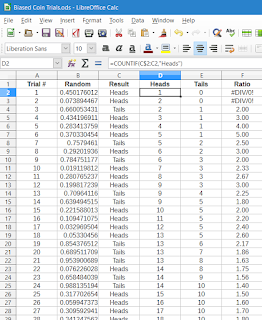 The random number generator for the simulator is set up to simulate a fair coin and so we would expect the ratio of heads to tails to be even (1:1) but only in the long run. 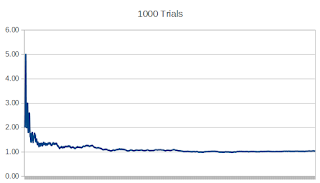 If we look at a chart after 10 trials we see the ratio is nowhere near 1:1 (1.0 on the chart). In fact the chart looks more like 2:1, refusing to go below the 2.0 line. 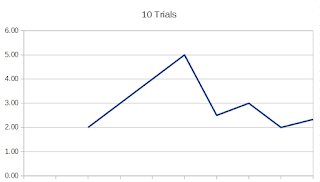 What can we say about the coin after 10 trials? Nothing. The same with 10 horse races. Our system might be winning after 10 races but is that down to luck or skill? 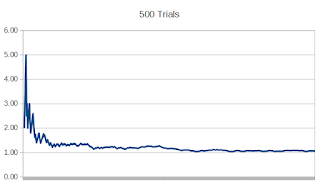 The simulation was continued for 50, 100, 500 and 1000 trials with charts displaying the heads to tails ratio. 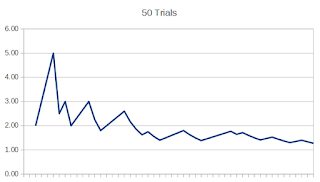 After 50 trials the chart was showing a trend towards 1:1 but could we now say the coin is fair? The actual ratio might be below the 1:1 line. 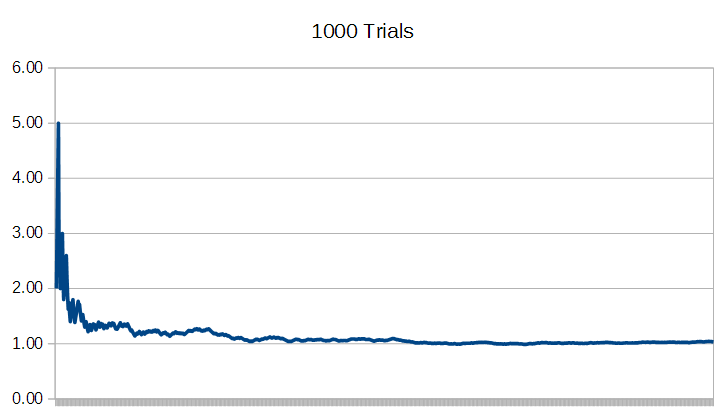 After 100 trials the chart appears to be settling above 1:1. Is the coin biased towards heads? 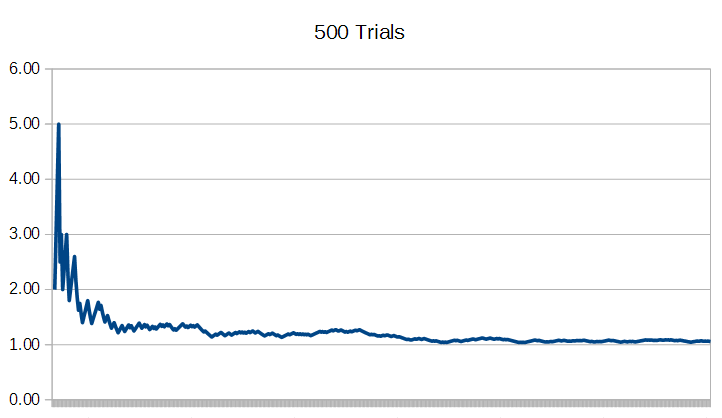 After 500 trials the chart is now showing a ratio for heads to tails of 1:1. The coin has reverted to the mean expected ratio. Our horse racing strategy might now be at breakeven but losing through commission payments. 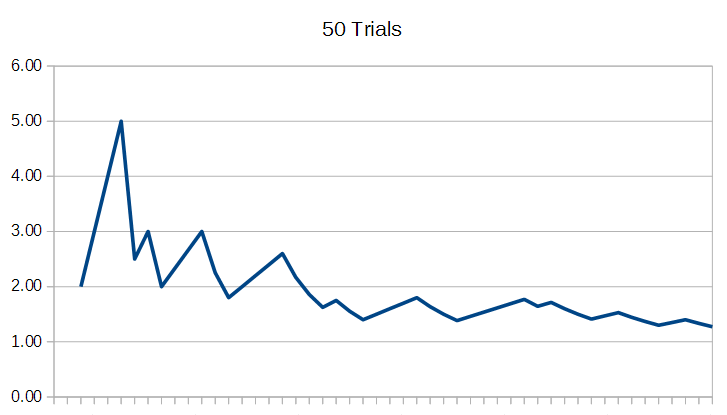 And again after 1000 trials. We might be confident that the coin is fair and has regressed to the mean. However, run the simulation again and you might not get 1:1 after 1000 trials of a fair coin. 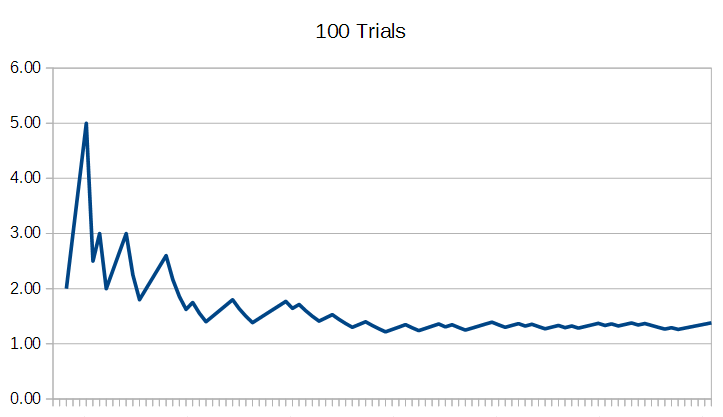 I have run this simulation many times and after 1000 trials it can settle far from 1:1. I know that I have created the sim to be fair but it will take many more trials than 1000 to get consistent results. You can never be too sure about the coin. These observations are true about sports betting markets too. With just a few races in a data set nothing can be said about the efficiency of market prices. Over hundreds of thousands of races, over many years, it is shown that prices tend towards their true value. Those who bet on horse races and who use starting prices should beware. A bettor creating a strategy must understand that prices tend towards fair during the course of a market's lifespan. Most who think they have tamed the markets are either very lucky or haven't been trading or betting long enough for mean reversion to drag them back to breakeven (minus commission - i.e. a loss). Most traders and bettors create systems with a limited life span and so they won't get the chance to take advantage of the long run. A losing system can have good luck or a winning system can suffer bad luck because they haven't been traded with long enough. You need an edge to have a chance of beating a market in the long run. As the simulation shows a negative edge can initially look like a positive edge and vice versa but in the long run you will mean revert if there is no edge and you will lose through commission losses. Another way of looking at the charts above is that they are time lines towards the start of horse races. When the line reaches the 1:1 ratio the market has happened upon the long run efficient prices. Before then everything is up for grabs. You can bet on value or you can trade the mean reversion. But what if you don't know if the coin is fair or not. What then? Maybe the coin is biased 2:1 in favour of heads but you don't know that it is. 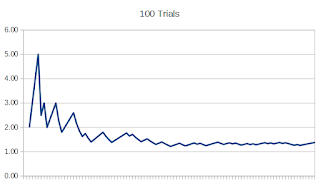 This is the main reason why I do not waste my time studying form and betting on fundamentals. I much prefer technical trading, working with mean reversion rather than against and preying upon other traders who get caught up in an exuberant market. I don't know what a price should be, I only know that when a race is about to start, prices will be fair in the long run but until the race starts there is the opportunity to take advantage of the indecision of the crowd until wisdom takes over. There are some good fundamental traders who can determine the optimal time to bet. Usually they have access to private data and the odds are against you being such a person.